The Congress president also addressed a rally in Bundi and a party workers' meeting in Jaipur where he attacked the BJP. 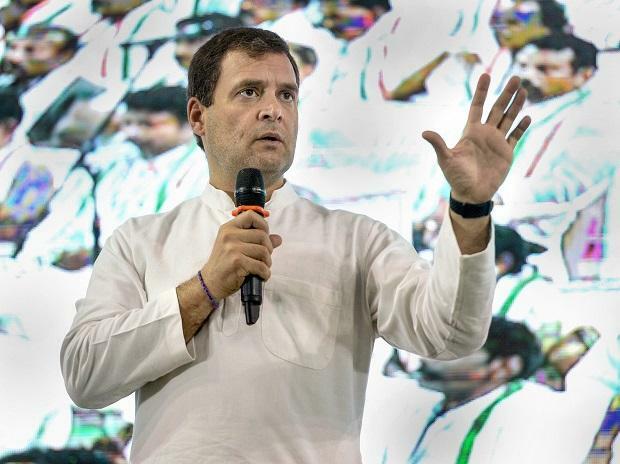 Congress president Rahul Gandhi Tuesday termed the promise of minimum guaranteed income to the poor a "surgical strike on poverty" and said his party consulted "big economists" including former RBI governor Rahuram Rajan before it came up with the idea. Addressing a rally in Suratgarh town of Sri Ganganagar district, a day after declaring his party would roll out the scheme if voted to power, Gandhi alleged Prime Minster Narendra Modi gave money to the rich and top industrialists, but the Congress would serve the poor. Targeting Amit Shah, Gandhi alleged that a bank owned by the BJP president in Gujarat changed currency worth Rs 700 crore during demonetisation. "Ek baar tukka lag gaya 2014 mein, wo alag baat hai (By chance they won in 2014. That was a fluke)," he said in Jaipur. Back in Suratgarh, his first rally of the day, Gandhi said the promised minimum income scheme was a "big bang". "Dhamaka hai ye...bomb fatega (It's a big bang...a bomb will set off). This is a Congress's surgical strike on poverty. They (the BJP) worked to eliminate the poor we will eliminate poverty." On helping the poor, he said "We thought how it should be done. After discussion and brainstorming, we thought there should be a minimum income line of Rs 12,000 per month. Soon after formation of the Congress government in 2019, the minimum income line in India will be Rs 12,000 per month." In Jaipur, he told his party workers the Congress consulted "all big economists, without telling anyone, without giving any speeches". "We were engaged in this work for six months. Take the list of all big economists of the world, we consulted them...Raghuram Rajan...one by one," he said. Back in Suratgarh, he alleged that poverty and unemployment increased under the Modi government. While the Congress-led UPA government lifted 14 crore people out of poverty, "Modi made them poor again", he claimed. Gandhi had announced in New Delhi on Monday that Rs 72,000 per year will be given as minimum income to poor families, benefiting around 25 crore people, if his party is voted to power. Finance Minister Arun Jaitley has dismissed the scheme, saying the Congress has a history of "cheating" the poor. In 1971, Rahul Gandhi's grandmother and then prime minister Indira Gandhi had given 'Garibi Hatao, Desh Bachao' (remove poverty, save the nation) slogan. Years later, PM Modi, during a speech in 2018, termed the 'Garibi Hatao' slogan a "false promise". Gandhi said that all those who took away public money from banks were "helped" by the NDA government, PM Modi, Shah and Jaitley. All of them have looted public money, he charged. He also targeted the government over demonetisation and GST. Banks changed the black money through the back door, he alleged. Gandhi charged Shah's son business of Rs 50,000 progressed to crores of rupees, tainted businessman Mehul Choksi transferred money to the account of Jaitley's daughter, and liquor baron Vijay Mallya met Jaitley in the parliament house before absconding. The Congress president reiterated his allegation on the Rafale deal, saying Modi helped Anil Ambani in getting the contract for manufacturing the fighter plane despite the fact that he had no experience in making aircraft. These allegations have been rejected by the government and Ambani. At the Bundi rally, Gandhi accused the prime minister of "hiding behind the Army" whenever any question is asked of him. "When you ask why there is so much unemployment, why farm loans were not waived, why Rs 15 lakh were not transferred to bank accounts, Modi hides behind the Army. "In his speeches from the Red Fort, he says that before he came, the elephant was sleeping. That means nothing happened in the country before he came (or became the prime minister) and the Army, the Indian Air Force, farmers and public did nothing," Gandhi said. He also said that no prime minister took credit for the actions of armed forces like Modi did. "Wars happened against Pakistan but no prime minister ever said (s)he did that. They used to credit the army and the air force. But Modi says he has done it. There is nothing without me (Modi) here. Were there no Army and Air Force before 2014?" he asked. Gandhi also promised 33 per cent reservation for women in Lok Sabha and state assemblies and in central government jobs if Congress forms the government in 2019. Chief minister Ashok Gehlot, his deputy and Pradesh congress committee president Sachin Pilot and other senior leaders of the party were present at the Suratgarh rally.